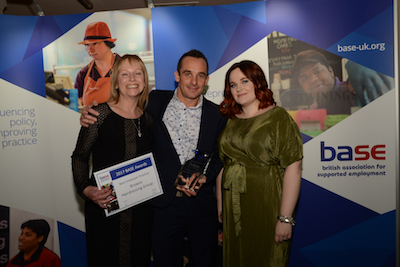 These awards recognise and celebrate outstanding practice in the field of supported employment in the UK. Their focus is on promoting the remarkable work that goes on across the country to help people with disabilities, and other disadvantages, get the support they want to achieve their work aspirations and retain paid employment. Read on for details of our winners for 2017. The winners of the Team of the Year Award are the World of Work Team at The Castle School in Newbury. The Castle School supports 165 students from the age of 3 to 19. Last year, 30% of their school leavers gained employment when they left school and the World of Work team have built on last year’s success of 100% conversion of supported internships in to employment. The team works individually with students to draw out aspirations and empower them to see employment as a real option and for most an expectation. Work experience must be meaningful for the student and employer and to ensure this we set clear targets for the student and employer. Last year 90% of targets were achieved. The school has focused on employer engagement over the past two years and they are now actively engaging with 68 companies. Employers locally will contact the team for advice and support in all areas of supported employment. Families of current, but also past students are supported fully to ensure employment opportunities either don’t get missed or are sustained. This can include support with applications, transport and finances. The team’s work helped to influence the local authority in commissioning a supported employment service in 2016. Handovers of students to the LA Supported Employment Service have been seamless which is vital from the employer perspective. The team continue to meet with the LA quarterly to ensure Supported Employment is still a priority and have recently agreed to become a hub for advice and support for all schools in the area. The team believe so strongly in employment that they have supported over 20 other schools/organisations to help them develop similar programmes through training sessions, meetings with leadership teams or presentations at conferences. They are always ready to meet requests for support from other organisations. The school is exceptionally proud of the fact that every post-16 student has had at least one work placement. The team believe that anyone with the drive and desire to work can gain employment. They are passionate and committed to changing the culture around disabilities and employment which is already seeing a change locally for all people with disabilities. This year’s winner is Carolyn Tucker of Surrey Choices. 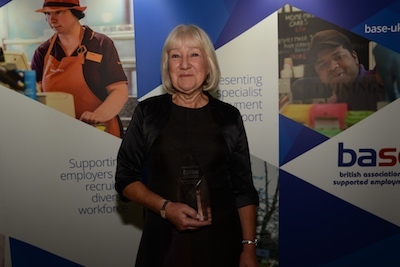 Carolyn has consistently, for the last 10 years, been in the top three performers for paid work in Surrey’s supported employment service. This year, Carolyn has found 16 paid outcomes and 15 voluntary roles for customers eligible for adult social care. She has also intervened to save a number of jobs for those on our Keep In Touch List (job maintenance). Carolyn carries a complex caseload as her line manager will often allocate her the most challenging jobseekers because of her positive aspirations. She always aims for paid work and her tenacious approach means that even on her days off she will pop by a business where she has placed people to check how they’re getting on and see if the company might have vacancies for another 1 or 2 people! She has an infectious sense of humour and will often share some jokes or random thoughts with the team, but when it comes down to negotiating for jobs she is the ultimate professional. Her high outcomes hide a very soft heart and she often goes beyond what’s expected. For example when one of our customers who lived alone was arrested and subsequently sent to prison, she thought about his dog and took it in and ended up adopting the dog permanently. She has provided many families with support and understanding and we’ve received so many testimonials from those people that she’s supported. They contain a common word – amazing! One of her customers has quite challenging behaviours, lacks communication skills and has a low attention span. She persuaded a local Costa to offer him paid hours with 1:1 support in place. The hours he works needed to be split into short sessions as his focus was so short, but she made it all seem so easy for the employer and although it has taken a lot of intervention, they have continued this for several years through different changes of managers. With her support, he has also been encouraged to get to know his fellow workers and they have integrated him into their team. I hope she doesn’t mind me saying this, but, now in her 70th year, Carolyn embodies the spirit of supported employment - anyone can work given the motivation, the right support and a tenacious Employment Support Specialist who just does not take no for an answer! The judging was very difficult this year because of the quality of the nominations. Sometimes it’s so close that we award a certificate of commendation and this is one of those years. 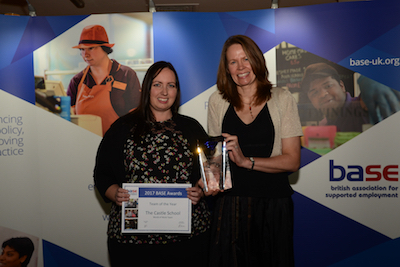 This year, we recognise the work of Andrea Randall-Smith, who's pictured (right) with Claire Cordell of Little Gate Farm. Andrea started working at Little Gate Farm two years ago as their first job coach and she is now head of their supported employment program, managing nine staff. She has developed a professional, structured, supported employment program that is reaching many learning disabled adults in Hastings and Rother, in her first year she placed 7 adults with learning disabilities into permanent paid jobs, this year 12, and she is now piloting a supported apprenticeship program with 4 young people starting this September, the first of its kind in East Sussex. Andrea has grown the Little Gate Farm Supported Employment program from scratch on a tiny budget; managing new employees, and ensuring they are properly trained to provide systematic job coaching and the very best support. 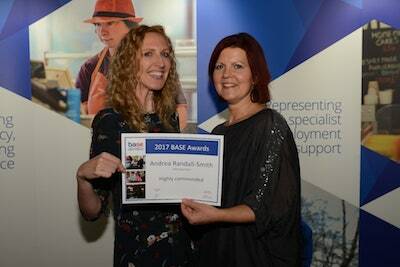 Andrea’s aim is to work with other providers in the area to establish a greater supported employment offer across East Sussex in partnership with other organisations. 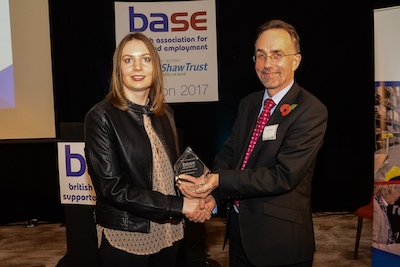 Her enthusiasm, honesty problem-solving and commitment have enabled her to develop excellent relationships with employers and has changed the culture towards learning disabled employees in numerous workplaces in the area. Andrea has been an integral part of the success of Little Gate Farm and their rapidly developing support. Our winner for Best Employer Practice was Browns Hairdressing Group. The award was presented by Dan McCormack, Head of Partnerships & Supply Chain at Working Links, who kindly sponsored the award. The Browns Hairdressing Group are a chain of six family run salons in the South of England with a strong commitment to diversity. They registered with the Downs Syndrome Association’s WorkFit programme in 2011 after seeing a television feature on our launch, and had little knowledge about Down’s syndrome. Browns were keen to recruit a candidate in their business, but admitted to finding the process daunting, with concerns about how a person with Down’s syndrome would cope in a busy, client-facing salon. In 2012 they hired Prem in their Buckingham branch as a salon assistant for two days a week. Prem has very limited communication skills and so required significant workplace support. The company went above and beyond what was expected to provide him with the necessary assistance by assigning a busy manager as a workplace supervisor. They used written instructions and visual aids to increase his independence and integrate with the rest of the team. When they saw him flourish they extended Prem’s duties and he has now been in employment for 5 years. The company deepened their commitment by creating and hiring three additional paid, permanent positions for people with Down’s syndrome at other locations within their business. 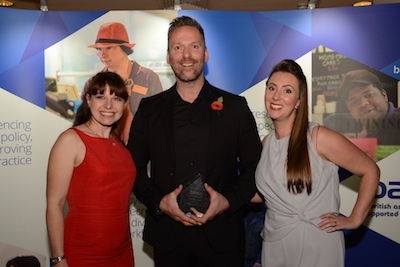 As a small to medium enterprise, Browns Hairdressing Group have demonstrated strong values and practice and deserve to be recognised with the Award for Best Employer Practice. The award goes this year to John Heron of St Camillus Care Group. He is pictured right with Holly Kelleher and Sarah Gautier of St Camillus. John Heron is an entrepreneur with a disability. As a teenager he found his opportunities to go into business were thwarted by a lack of belief in his business acumen and entrepreneurial skills and was offered very few opportunities to go into business. Those opportunities he was offered were low skilled, often unpaid, and he realised that this was the ‘standard offer’ for young people with disabilities. John refused to accept this and has become a very successful businessman, owning a property development company. In 2006, John embarked on a new business relationship with Steve Talbot, and while building student accommodation they decided to move into hospitality, renovating business premises which were not meeting their potential, and using them to exclusively train other people with learning disabilities and autism. In May 2016 St Camillus Care Group acquired its first commercial venture, The River’s Edge Hotel in Gateshead and committed to a £2 million renovation to restaurant, function room and 28 bedrooms. They employed hospitality staff and a Supported Employment practitioner to offer training and supported employment services to young people with learning disabilities and autism. John and Steve set up their venture as a commercial business, prioritising customer service and commercial viability (profits) so they could offer paid, secure employment to those they trained. John developed a close relationship with a local college to develop a Supported Internship programme and Traineeship provision. He also employed a Transition Manager to secure employment elsewhere if the young people’s career aspirations do not lie in hospitality. John and Steve have purchased an additional hotel in Blackpool and 2 restaurants in Newcastle, demonstrating that having a disabled workforce and having a successful business can go well together. 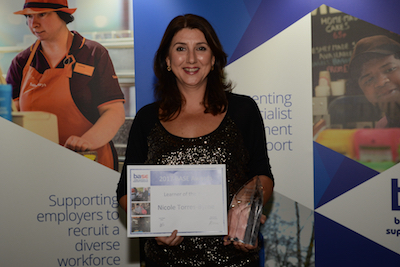 Our winner this year is Nicole Torres-Byrne. Nicole connected with BASE some years ago as the aspirational parent of a child with a disability who was looking for consultation and assistance in setting up supported employment services in Gibraltar. She attended some training courses and conferences in the UK before setting up a skeleton service under the Gibraltar Disability Society with her as the sole volunteer. At the same time, she tirelessly lobbied the Government in Gibraltar to fund the service, and was finally successful. Nicole decided to undertake the Certificate for Supported Employment Practitioners qualification, to ensure that a quality service was developed. Acquiring funding from the Kusuma Trust and Department of Education as she was so keen to up-skill herself to best benefit the disabled population in Gibraltar. She's proven to be a quick and eager learner, sharing her experiences with others and becoming a fine practitioner. Whilst gaining the Certificate, Nicole has used her skills to establish the first ever appropriate Supported Employment Service in Gibraltar and she is now paid for her efforts. The service is expanding and in her first year she has formalised the offer to young adults and also developing supported internship provision for young people in their last year of education. Her work is proving key to the drive to increase the number of disabled people in employment in Gibraltar. Mollie Wallace has been working for Softcat (an IT infrastructure provider) for just over a year and a half and has already developed herself and her role massively. She has a very varied job and is responsible for running the Sandwich Bar, supporting in the IT department, and post room as well as maintaining a garden area by the main entrance (Mollie’s own idea). She has increased her hours to full time and taken on additional responsibilities. The Sandwich Bar which forms the main part of Mollie’s role, was a new venture for Softcat and Mollie has been key to its success. Mollie has built up her skills in customer service, till use, sales and even making delicious smoothies. One of Mollie’s biggest achievements was the idea to provide a delivery service for the Sandwich Bar. She takes around a selection of products to the different office areas, and sells to people at their desks. This was fully supported by Softcat, and has proved to be a great success. Mollie has become a well-respected and valued member of the team. She is friendly and cheerful at all times and is fully included in the team, regularly socialising with her colleagues in and out of work. “Where do I start with Mollie. She is a Softcat superstar! Mollie is efficient, diligent, and hardworking. She is innovative, committed, and always willing to go the extra mile. Mollie continues to learn and develop daily, and a pivotal part of our business. I can hands down say Mollie is one of Softcat’s favourite employees, she has exceeded all our expectations and Softcat is a better place for having her around”.